Sir Targray oversees the original chapter of the Blue Sentinels based in the Cathedral of Blue in Heide. Although he sometimes comes across as condescending due to his unwavering faith in the righteousness of his actions, in reality Targray is selfless and stoic; determined to train himself to achieve a higher state of mind and help fellow Knights of Blue. 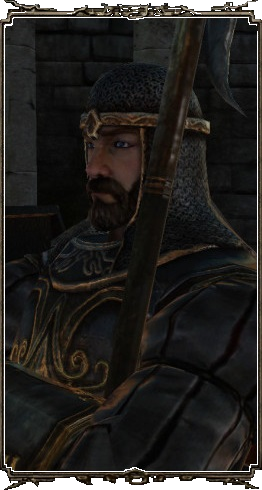 Targray remained in Drangleic to continue supporting his comrades even after people began fleeing the ruined kingdom and he himself became Undead. Found on the balcony after the fight with the Old Dragonslayer, and before the Cathedral of Blue bonfire. If you speak to him with a Token of Fidelity in your inventory, he'll give you the option to join the Blue Sentinels covenant. Guardian's Seal Join the Blue Sentinels covenant. "Duel Bow" gesture Join the Blue Sentinels covenant and speak to him. Spirit Tree Shield Speak to him after reaching Rank 1 in the Blue Sentinels covenant. Wrath of the Gods Speak to him after reaching Rank 2 in the Blue Sentinels covenant. Bountiful Sunlight Speak to him after reaching Rank 3 in the Blue Sentinels covenant. Targray's Set Speak to him after reaching Rank 3 in the Blue Sentinels covenant. Monastery Charm 3 2,200 Heals poison and restores HP. Holy Water Urn ∞ 300 Throwable item that damages hollows. Boltstone ∞ 7,000 Used to infuse weapons with Lightning. Cracked Blue Eye Orb ∞ 10,000 Only available in NG+ and above. Will only sell you items if you're in the Blue Sentinels. You'll have to be in actual NG+ for him to sell infinite Cracked Blue Eye Orbs. Using a Bonfire Ascetic won't work. Drops only his halberd if slain. Merchant Hag Melentia will have his armor set for sale. It costs 6,000 souls to revive him from his gravestone. An easy way to obtain a Token of Fidelity is to loot the one that can be found on a corpse under the giant wooden bridge leading to the Undead Purgatory. This is no place for one such as you. Be gone. You are not needed. Transient being, nothing has changed. You would never make a Knight of the Blue, and I have nothing more to say. You have obtained proof, you are worthy of joining our Order. You may call yourself one of us, and are free to plant your roots in this garden of the gods. Be proud. I, Targray, do proclaim, from this day, you are a Knight of the Blue. Rejoice, and bask in your new honour. You are no longer a mere vagabond. You are now a guardian, a Knight of the Blue. Wear this ring, and shine light upon stone. Then, you will hear the voices of the blue apostles. Listen for their cries of help, and repel the malicious invaders. This is the proud work of the Knights of the Blue, the way they elevate themselves to a higher plane. I'll provide what you need. You may visit me at any time. Who would refuse such magnificence? Gods, have mercy…on this halfwit. He knows not what he speaks. You are a wandering transient. Do you rescind your ways, and seek honour as an apostle of blue? Proud knight, you may come to me, Targray, for help. We Knights of the Blue must rely upon one another to achieve our greater goal. Present your Token of Fidelity. …to test your strength against other knights. Take your Token of Fidelity, and stand there. Proud knight, aim high in all things. We knights must protect the apostles of blue. Never forget this fact, and by your honour, never eschew your training. There are others in this forsaken place who have only a lust for blood. They conspire to ambush blue apostles on the road. Knight of the Blue, protect our apostles from these bloodthirsty brigands. Take pride in your duty as a Blue Knight. Work hard, and pursue a higher plane. Be gone…And be forever transient. Be gone…There is no mercy for your kind. Pursue your work, Knight of the Blue. Do your work, and I will lend you strength. You've achieved much, and approached a higher plane. But our path is long and arduous. We must always seek further challenges. Knight of the Blue, you have accomplished much. You are closer still to a higher plane. You will continue to lead the weak and misguided. May you always stand proud. We walk along an endless path. Along the way, we see glimpses of a higher plane. We challenge ourselves, until we breathe our last breath. May you achieve great things. You are my greatest challenge. Welcome back, my greatest challenge.